It’s easy to spend more than $40,000 on a standard-engine Flex, and the EcoBoost Flex, fully loaded, can hit $50,000. Watch those options and stick with one of the lower trims if you want to mind the bottom line. The 2010 Ford Flex is one of the most stylish new crossovers on the market, with great passenger room and enough features to make everyone happy. TheCarConnection.com's editors have driven the Ford Flex—including the new EcoBoost versions—in order to help deliver the best information on Ford’s new crossover and its competition. 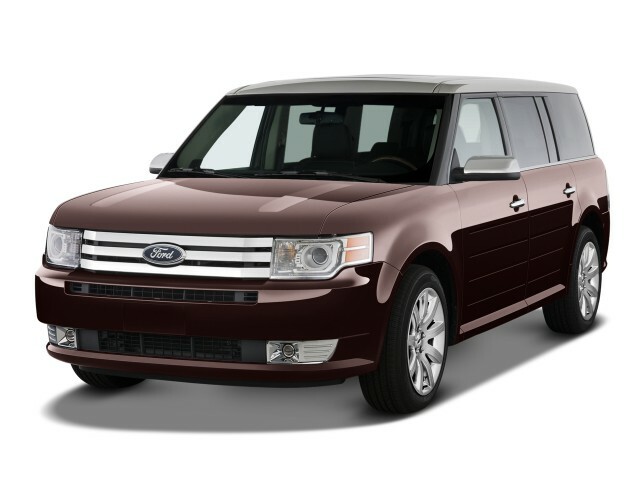 The experts at TheCarConnection.com have also researched online reviews from respected Web resources to produce this comprehensive review of the 2010 Ford Flex. As a Ford model, the 2010 Flex sets itself apart from the pack by being completely different from other crossover vehicles, thanks in part to its slab-sided styling. Influences come from all over the globe, and keen observers will note the cues taken from American station wagons, the chic MINI Cooper, and the acclaimed Land Rover Range Rover—from its ribbed sides to its wide nose to its white- or silver-painted roof. There is substance inside as well, where the Flex sports a low instrument panel with blue-lit gauges, a red-lit pair of cup holders in the center console, and a choice of fabric seats with tweedy trim or leather in the range-topping variant. In basic trim, the 2010 Ford Flex relies on a 3.5-liter, 262-horsepower V-6 engine for its power. The engine is coupled to a six-speed automatic transmission. Front-wheel drive is the norm, while the Flex also offers all-wheel drive as an option. This year, there is a new twin-turbo EcoBoost V-6 engine available for the SEL and Limited variants of the Flex, and according to Ford, the new engine packs the wallop of a V-8 while delivering the fuel economy of a six-cylinder engine—the new twin-turbo EcoBoost V-6 produces 355 horsepower at 5,700 rpm and 350 lb-ft while still returning 16 mpg city/22 highway with standard AWD. The 2010 Ford Flex offers seating for up to seven in a very roomy cabin. Although the headrests are a little intrusive, the front two seats have the comfort of Volvo chairs. In the second row, you’ll find seats that are comfortable with lots of legroom and high seating positions. New for 2010 in the second row is the option to have a 60/40 bench with a new AutoFold feature. The third-row seat has enough legroom for adults, but taller passengers will be left wanting for headroom. This year's Flex has been chosen as a Top Safety Pick by the Insurance Institute for Highway Safety (IIHS), and the Flex received the top ratings of "good" for both frontal offset and side impact collisions. NHTSA’s vehicle assessment program also gave the Flex five stars for both driver and passenger protection, and four stars for the Flex’s rollover rating. The Flex's comprehensive set of safety features includes six airbags, anti-lock brakes, and stability control with anti-rollover technology. The features offered as standard equipment and as options on the 2010 Ford Flex are impressive, with the choice to spec the car up or keep it basic. That said, the Flex’s options go far beyond power windows; the Flex has third-row seats and a CD player standard, with options including Ford’s SYNC system, navigation, a second-row refrigerator and footrests, a 10-speaker Sony audio system with Sirius Travel Link, and a glorious four-panel Vista Roof that opens up the Flex’s cabin to the sky. New for 2010 will be an optional dual-headrest DVD entertainment system. The 2010 Ford Flex is like nothing in the crossover segment—but it echoes two of TheCarConnection.com’s most style-forward vehicles, the Land Rover Range Rover and the MINI Cooper. If there’s one thing that’s indisputable about the 2010 Flex, it’s that nothing else on the road looks quite like it. The only place you will find some hereditary resemblances is if you stumble upon the much smaller MINI Cooper or the much higher-priced Range Rover—both style icons in their own right. Inside, the Flex features an interior that is “the best in the Ford lineup,” according to Automobile Magazine. 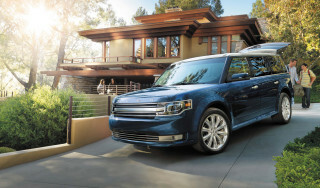 TheCarConnection.com sees hints of the high-end fashion and furniture that Ford stylists say they looked to when designing the interior of the 2010 Ford Flex. The best interior package has black leather seats with white stitching, a neat touch that adds some class. The 2010 Ford Flex performs well enough with the base engine, but it's all the more impressive with the twin-turbo EcoBoost V-6. The 2010 Ford Flex offers a choice of two powertrains, a base-level naturally aspirated 3.5L V-6 and the range topping twin-turbo 3.5L V-6. 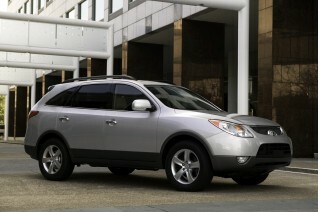 The base engine is available with either FWD or AWD, while the range-topping turbo engine is only available with AWD. Automobile Magazine notes that the 2010 Ford Flex’s standard engine is “the same 3.5-liter V-6 found throughout the Ford, Mazda, Mercury, and Lincoln brands.” In the Flex, Ford will push the base V-6 to 262 hp and 248 pound-feet of torque. In other applications, TheCarConnection.com notes, this engine produces ample power, with a touch of noticeable engine noise at the very top of its rev range. Edmunds states with “an estimated curb weight of 4,650 pounds, Ford says the Flex will accelerate to 60 mph in about 9 seconds” using the standard engine, which may put it a second slower than the large crossovers from General Motors (Saturn Outlook, GMC Acadia, Buick Enclave, and Chevrolet Traverse). Meanwhile, the 2010 Ford Flex is also available with a 355-horsepower twin-turbo V-6 that offers startling performance. According to Motor Trend, “the new engine is surprisingly smooth and does a fantastic job of getting the crossover up to speed.” Autoblog observes that “the twin turbos in the Ford made the difference at altitude, making a quantifiable difference in pulling up hills and on flats.” TheCarConnection.com notes that turbo engines have an efficiency advantage over naturally aspirated engines when in high-altitude situations. The 2010 Ford Flex comes with a single gearbox, a six-speed automatic transmission that was co-developed with General Motors. 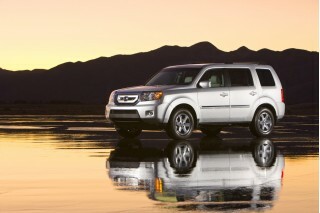 For 2010, the six-speed was strengthened to take on the extra twisting power from the new EcoBoost engine. There’s also an “intelligent all-wheel-drive system, capable of routing 100 percent of the engine's torque to either axle,” Edmunds adds. All-wheel drive is still “optional,” Car and Driver points out, except in the case of the EcoBoost engine. Ford says the base-engine front-drive version of the 2010 Ford Flex is rated at 17/24 mpg, while the all-wheel-drive Flex gets 16/22 mpg. Edmunds says it is rated to “tow up to 4,500 pounds.” The EcoBoost model returns 16 mpg city/22 highway with standard AWD—the same fuel economy as the naturally aspirated variant, but with a large power advantage. The 2010 Ford Flex impresses with its spaciousness, interior comforts, and high-quality cabin. Jalopnik reports that the second-row seats “are firm and they travel on tracks so you can go all the way from huge legroom in the middle row and a reasonable amount in the wayback, or comfy legroom for all.” Edmunds adds that “there is 7.5 inches more legroom in the second row of the Flex than in the slightly longer Chevy Traverse crossover,” and in the third row, “some 8 inches more than a Chevy Tahoe.” Autoblog, meanwhile, says, “The Flex's seats are fine places to be: big, flat, comfy chairs [that are] perfectly cushy and supportive enough to get you over the long haul.” Jalopnik is also pleased with the sunroofs—all of them—"were quite a sky-sight to behold. All in all, we were pleasantly surprised and look forward to spending some time with it on our own terms.” Visibility is a strong point in the 2010 Ford Flex, Car and Driver attests. 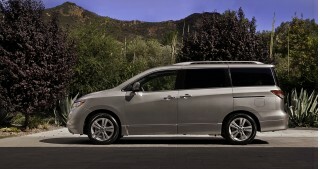 TheCarConnection.com notes that the 2010 Flex demonstrates fine assembly quality. The materials, and the way they work together, are a step up for Ford—the door panels have faux-wood trim, metallic bands, leather, and plastic all next to each other, and they come off as high-quality pieces, rather than cheesy attempts at making the Flex seem more high-end. There is some hard gray plastic, banished to places where hands don’t usually touch. The 2010 Ford Flex is one of the safest vehicles on the road. This year’s Flex has been chosen as a Top Safety Pick by the Insurance Institute for Highway Safety (IIHS), and the Flex received the top ratings of "good" for both frontal offset and side impact collisions. 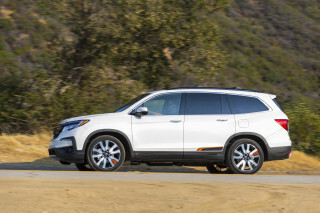 The NHTSA’s vehicle assessment program also gave the Flex five stars for both driver and passenger protection, and four stars for the Flex’s rollover rating. Standard safety features on the 2010 Ford Flex will include front and side-mounted airbags, a three-row “Safety Canopy” curtain airbag, AdvanceTrac stability control with rollover-limiting technology, and an optional, rear backup camera, Edmunds reports. New for 2010 is Ford’s MyKey system, which allows parents of teenage drivers to set limits on certain aspects of the car. For example, the top speed can be limited to 80 mph, and the volume of the stereo can be limited. Traction control can't be deactivated, and there are audible warnings at certain increments for the driver if the MyKey system is being used. The 2010 Ford Flex is fantastically equipped, with a laundry list of high-tech options. The 2010 Ford Flex impresses in the passenger cabin, thanks to its glorious amount of electronic and common-sense features. The Flex sets itself miles apart from the current range of crossovers due to all the options and standard equipment available. Just in terms of electronics, Ford offers its SYNC system, which uses voice activation to command MP3 players, cell phones, and an optional navigation system. A new development for 2010 is the fact that the mid-range SEL model now gets the SYNC system as standard. There is also a Sirius Satellite Radio with optional Travel Link services that provide traffic, weather, and other information on the go; an optional Sony audio system with 700 watts of power and surround sound; and a rearview camera for safety and visibility. 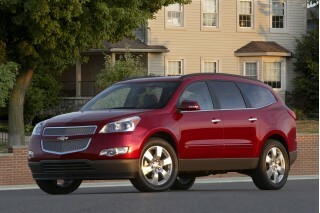 New for 2010 is the ability to request a dual-headrest DVD entertainment system that will set buyers back $2,000. Other key features will be the optional four-panel Vista Roof and a hidden keyless entry pad that responds to a swipe of a finger like the Apple iPhone. Last year, Edmunds remarked that their “only complaint” was that there wasn’t a telescoping steering wheel; Ford has finally responded and rectified the situation, making the Flex even more attractive. All three versions of the 2010 Ford Flex offer ample standard features. The Flex SE includes an AM/FM/CD player, 17-inch wheels, MyKey, and three-row seating. 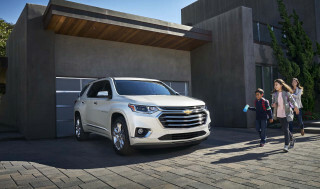 The Flex SEL adds on some chrome exterior trim, a Sony audio system, the SYNC system, MyKey, and Sirius Satellite Radio, as well as bigger 18-inch rims. The 2010 Ford Flex Limited piles on features like a 110V power outlet, high-intensity discharge headlamps, a power tailgate, Ford’s SYNC entertainment system, and 20-inch rims. Buyers can also choose from a myriad of color combinations to customize the Flex, including the contrasting roof option. Great alternative to a van! Bought this second hand with only 10000 miles on it. We now have 50,000 and no problems yet. Very versatile vehicle. We were able to tow our 3000 lb. tent trailer through the mountains without a problem. Very... Bought this second hand with only 10000 miles on it. We now have 50,000 and no problems yet. Very versatile vehicle. We were able to tow our 3000 lb. tent trailer through the mountains without a problem. Very good fit and quality, really enjoy the interior. With the 3.5 ecoboost it has a lot of power and still gets decent gas mileage for such a big vehicle.